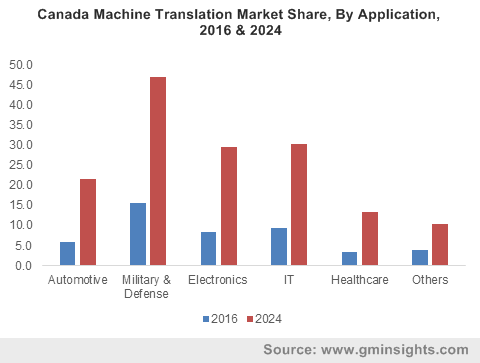 Machine Translation Market size was over USD 400 million in 2016 with 19.0% CAGR estimation from 2017 to 2024. The machine translation market is advancing at a rapid rate and in order to keep pace with the translation requirements, companies are becoming increasingly aware of the need to localize content into more languages. This is due to the rising demand for location based content across various industrial verticals such as e-commerce, electronics, travel, e-commerce and hospitality. The technology aids in providing information to the end users in their native language which is an absolute must-have to gain prominence in the business, driving the global machine translation market. The importance of localization is recognised by most businesses today as it helps businesses to win over customers’ trust and establish strong relationships with them that helps them build their brand image. The MT engines shorten project timeline and helps in reducing costs for customers as they can localize content specific to the requirements driving the machine translation market growth. Services such as Google translator have proven to be successful as it can translate any document or word segment in any language for free of cost. RBMT technology is predicted to grow at a CAGR of over 14% from 2017 to 2024 due to the usage of verbal information to precisely break down the target and source languages, making it more predictable and grammatically superior than other approaches. It can also be customized with a terminology management system to modify the generated text by specifying the terminology that should be used. Hybrid, example based, and neural machine translation market share may witness substantial growth. The hybrid model uses both rule based and statistical based translation approaches to create several variants at the sentence and lexicon structure level. This is done to attain the advantages of both RBMT and SMT, since RBMT aids in the formation of syntactically linked and grammatically correct script, whereas SMT aids in achieving rapid learning ability and acquisition of data from parallel quantities in automatic mode. Healthcare applications are anticipated to witness growth due to the booming research and clinical content. It helps in translating medical documents, insurance claims forms, web medical help, patient records, studies and papers, educational materials, warnings and IVR scripts. The integration of the technology helps a physician to communicate with the patients to provide better diagnosis and precisely analyze the patient’s issues. E-commerce applications in the machine translation market are also witnessing immense growth due to the increasing e-commerce demand worldwide. Major e-commerce players including Amazon, Alibaba and eBay are already using machine translation to sell more by expanding to new languages and to new countries. The most widely-spoken languages such as Chinese, English, German, etc. are no longer sufficient and they are focused on supporting new, less-commonly spoken languages. Asia Pacific, driven by India and China machine translation market size, will witness attractive growth owing to the rising demand for localization in native languages by several firms to enhance their global reach and therefore cater to customer requirements effectively. In India, several organizations are supporting the integration and deployment of MT tools and programs to reduce the communication barriers. With the launch of the government's "Digital India" initiative, India is poised to grow significantly in the global IT industry, which will offer ample opportunities for the companies to expand their reach in the Indian market. Government initiatives and grants, especially in countries such as the U.S., China, India, and Spain will provide lucrative opportunities to the machine translation market. For instance, in 2015, the Spanish government announced that it has allocated USD 97.21 million for the development of natural language processing technologies. Industry participants include Lionbridge Technologies Inc., Moravia IT, Systran International, Google Inc., Microsoft Corporation, and IBM Corporation. To curtail intensifying competition and gain market share, players are significantly investing in R&D for product and technology development. For example, companies like Google and Systran have launched solutions based on latest Neural Machine Translation (NMT) technology. In November 2016, Systran launched its NMT engine named as PNMT that offers organizations the capability to translate the content close to human fluency across several industry verticals. Several players in the machine translation market are entering frequent mergers and acquisitions to expand their product offerings and global reach. The presence of human translators may inhibit the market growth. MT is a cost-effective method of translating huge volumes of content. Automated translation is becoming broadly accepted and is used by several agencies or LSPs, as they attempt to meet the requirements of their customers by offering quick turnaround times. Used alone, it is not a replacement for content that necessitates high quality human translation, however with the intervention of the post-editor to modify, edit, and correct the pre-translated data, MT becomes a feasible alternative service offering. Due to this the demand for professionally trained post-editors is rising.